Egusi soup, in which I channel my inner ‘Edo‘ girl. For this is the soup by which we are woken up on many a morning, ladled into yellow enamel bowls, motifed with green leaves and rimmed in red. Covers clanging, hiding the pungent, fried scents of Une. What we call locust beans. And what the Yorubas call Iru. The smell of the soup is undeniably ‘hometown’ to me. There’s something ‘local’, elemental. Its not soup I would expect to feast on in a city. No, this is the preserve of the grandmothers and aunts who have learnt from tradition, and live it daily. 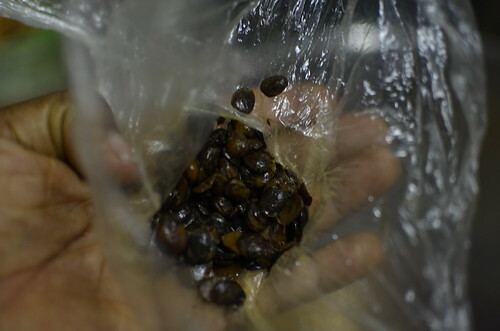 The seeds (of the locust bean) are famous for their greasy extract, which is fermented and pressed into cakes or balls, known in West Africa as dawadawa. 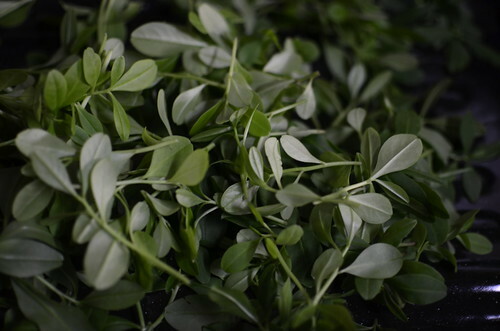 It has a pungent odor, often compared to that of aged cheese, and is used as a condiment or an ingredient for soup. 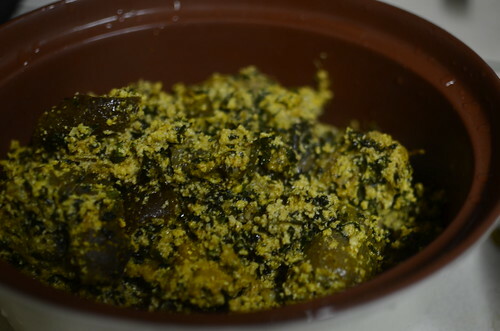 Our Egusi soup is always served with ‘Poundo’. As in ‘real’ Poundo, beaten to submission by the noisy pestles of silent women. ‘Up, down, kpom, kpom‘, they pound – partners in a rhythmic dance that needs no human words or intervention. The result? Fine, smooth, stretchy pounded yam. Not stirred in a pot, on a stove, in some microwave somewhere. Served on an enamel tray. 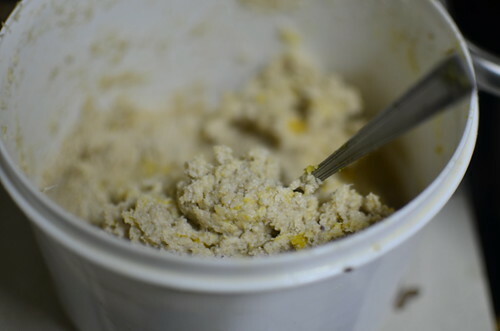 The balls of Egusi, distinct knots of cream in this spicy melange. Where they sit…..thick with promise. Of fullness and sustenance – that leave the eater sated, ready to battle another day. There are many kinds of Egusi soup, and I’ve cooked the lot. From light and creamy, to thick and peppery and every version in between. But first, you probably want to know what Egusi soup is, if you aren’t familiar with it? I’ll tell you. 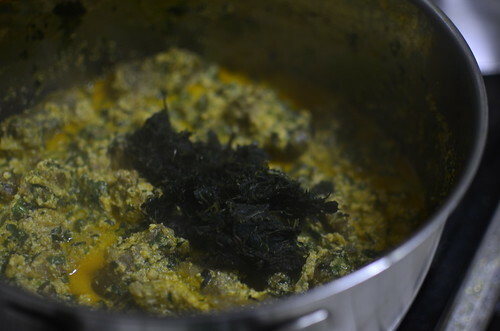 It’s an eating soup, in the manner of other Nigerian eating soups – really stews, that’s thickened with crushed melon seeds (in the family and whitened versions of pumpkin seeds), often with a variety of green vegetables which range from Bitter leaf, to Amaranth leaves aka Green, pumpkin leaves and water leaves too. Meat, fish, chicken? All are fair game in this soup that can be cooked any which way. The Ghanians have similar Egusi-type seeds. I can’t remember what they are called. 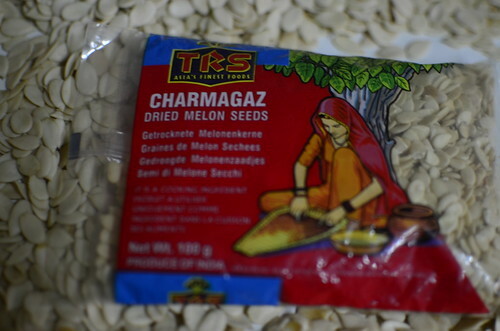 As do the Indians, called Charmagaz. 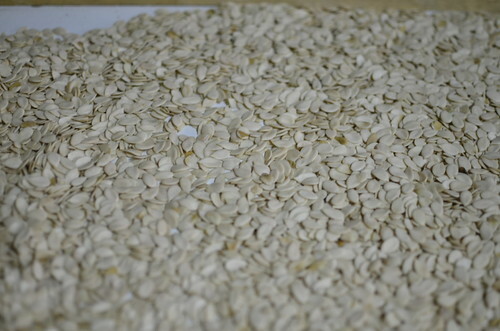 The seeds are used in markedly different ways from how we Nigerians use them – in sweets and puddings and fudges. And those in the west, The Yorubas make theirs similar to how we, the Edos in the south, make ours. The egusi is formed into balls which are then lowered into simmering stock and left to bubble away till the balls are cooked, shedding their creamy white colour for a thickened, orange appearance. The spectrum is long, and wide – as varied as the people who call it favourite. My Egusi soup leans more to the south than elsewhere. To my hometown of Igarra. Where thickened balls are welcome. For breakfast. I cooked this soup when I had a craving. A deep, deep craving that would not go away. I imagined it would be a buffet of meats and fish and vegetables. Served in one pot :-). 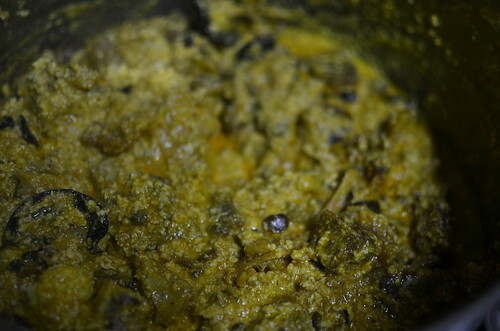 It would be flavoured with Une – fermented locust beans….which would lend a certain ‘grandmother’ essence to the dish. This is one of the most important food condiments in Nigeria and many countries of West and Central Africa. It is used in much the same way as bouillon cubes are used in the Western world as nutritious flavouring additives along with cereal grains sauce and may serve as meat substitute. Dadawa (Iru) is prepared from the seeds of African locust beans, thus are rich in fat (39 to 40%) and protein (31 to 40%)(Achi,2005) and contributes significantly to the energy intake, protein and vitamins, especially riboflavin, in many countries of West and Central Africa. 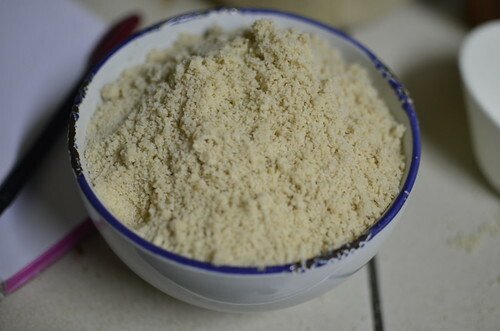 Dadawa or iru is made from locust-bean (Parkia biglobosa) seed, a leguminous tree found in the Savannah region of Africa, Southeast Asia and South America. Dadawa is produced by a natural un-inoculated solid –substrate fermentation of the boiled and dehaulled cotyledon, the major fermenting organisms are the Bacillus andStaphylococcus. 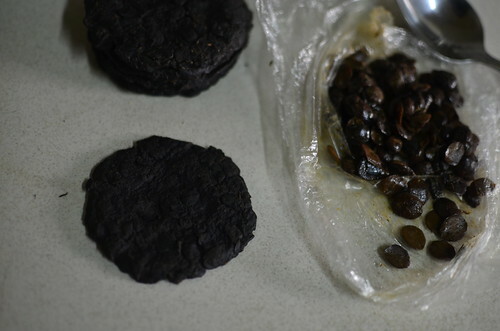 The beans mass after fermentation is sun-dried and moulded into round balls or flattened cakes. Due to the high protein content, it has a great potential as a key protein source and basic ingredient for food supplement. All the meat – the various sorts, would be chopped inch-wise and bite-sized so that the phrase ‘everywhere na market‘ would spring to mind. Meaning, everywhere you put your fork or fingers, you get the goods. I wanted nuggets of ‘turf’ – as in seafood, in this surf & turf soup. Flavour by way of stock fish. I wanted green and a hint of bitterness, provided by the humble, highly nutritious ‘Bitter Leaf’. 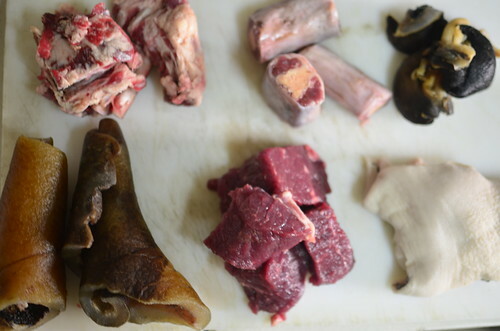 Cook your meat, stockfish, and other proteins prior to starting the soup. In my case, I cooked the beef and biscuit bone together, in a seasoned stock which I reserved for the cooking of the soup. 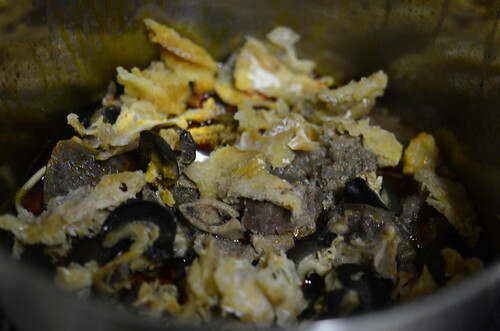 The tripe was cooked separately with the cooking liquid discarded, as were the stockfish, snails, oxtail and Kpomo. Cooked Meat & fish, quantity and variety to personal preference and stock reserved. I used a combination of beef, tripe, stockfish, oxtail, biscuit-bone, snails and kpomo (cow skin). 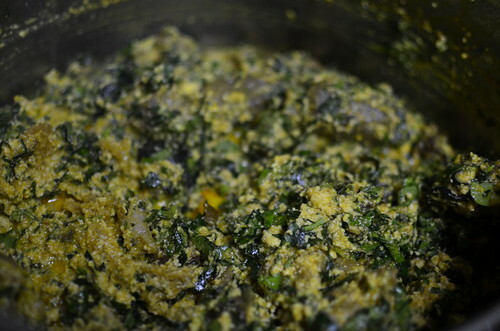 Begin by making a thick paste of the ground Egusi seeds, and the blended onion mixture. Set aside. 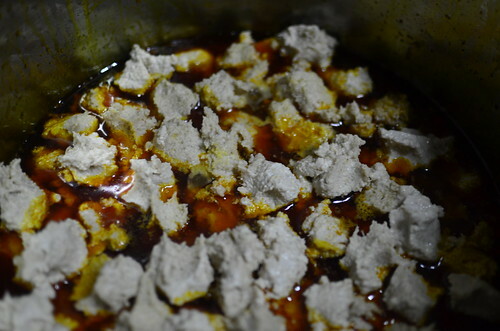 In some areas, people roll little balls of this paste which are then lowered into the cooking stock. I find it easiest to use a teaspoon to form the ‘mounds’ from bowl to pot. In a large pot, heat the palm oil on low to medium for a minute or so then add the Une/Iru. This ensures that the pungent, savoury flavours of the fermented locust beans are extracted. 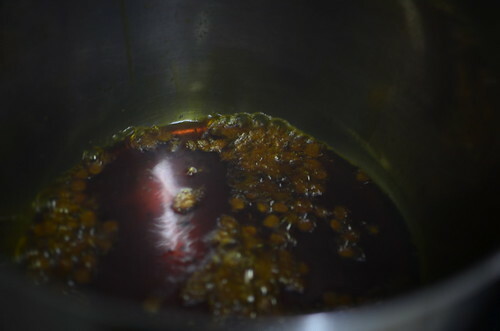 Then, slowly add the stock – yes I know….oil and water. Set on low heat to simmer. Scoop teaspoonfuls of the egusi paste mixture into the stock, being careful that they stay whole, till all the egusi is used up or add the prepared balls if you’ve gone down that route. Leave to simmer for 20 – 30 minutes so the balls cook through. Gently add the meat and fish and other bits which you’d like to use. First to go in are the pumpkin leaves – not whole though….cut up. Then the waterleaf is next. 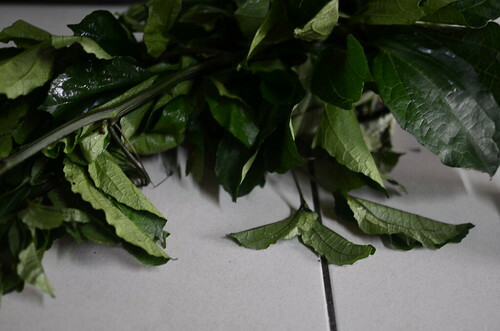 Once added, stir and put a lid on the pot and allow cook for 5 – 10 minutes, till the leaves wilt. Finish off by adding the Bitter leaf! Leave the lid off while the cooking finishes for another 5 – 10 minutes. We – at least my mum and I believe that if the lid is left on, the bitterness from the leaves takes over the soup. Stir, check seasoning and adjust accordingly. Turn off the heat and set aside to ‘cool’. On any good day, I like to leave let my Egusi soup rest for a few hours or ‘overnight’. On this day, I had my friends over to dinner. We ‘wacked’ (ate, Nigerianese) . It was ‘tech’ (awesome, Nigerianese). For you – well, serve with any starch of your choice. 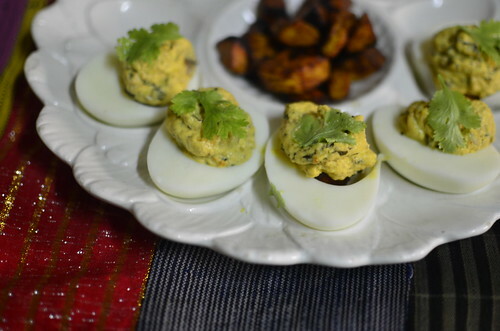 I love it with pounded yam and eba, but also with steamed white rice, and plantains….and as the filling for devilled eggs.